On rare occasions I take a short hiatus from thinking about training, writing about training, and training, to actually go rock climbing. Over the New Year’s Holiday the family and I headed west to the warm climes of St. George, Utah for a week of climbing. 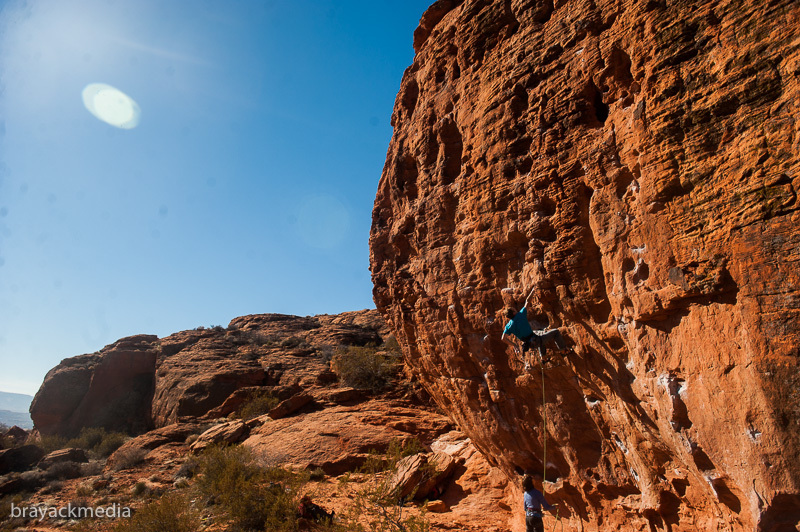 St George is home to a vast array of rock climbing possibilities, from the Grade VI Big Wall free and Aid climbs of Zion, to the bouldering of Moe’s Valley, and everything in between. 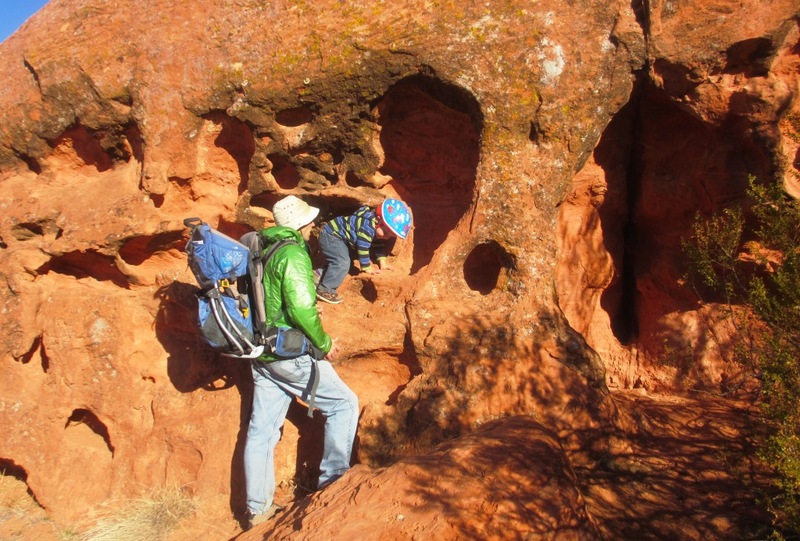 The guidebook lists more than 40 distinct crags, and the area hosts a wide variety of different rock types, including sculpted sandstone, basalt, Volcanic tuff, conglomerate, and some of the best limestone in the US. Sunny steep stone in the capital of Utah’s Dixie. Fencing with Tortuga, 5.12a, at The Turtle Wall. Photo Dan Brayack. My primary objective for the trip was a power endurance route called “Breakin’ the Law“, which climbs out the upper of two shallow limestone caves at the Black & Tan crag. 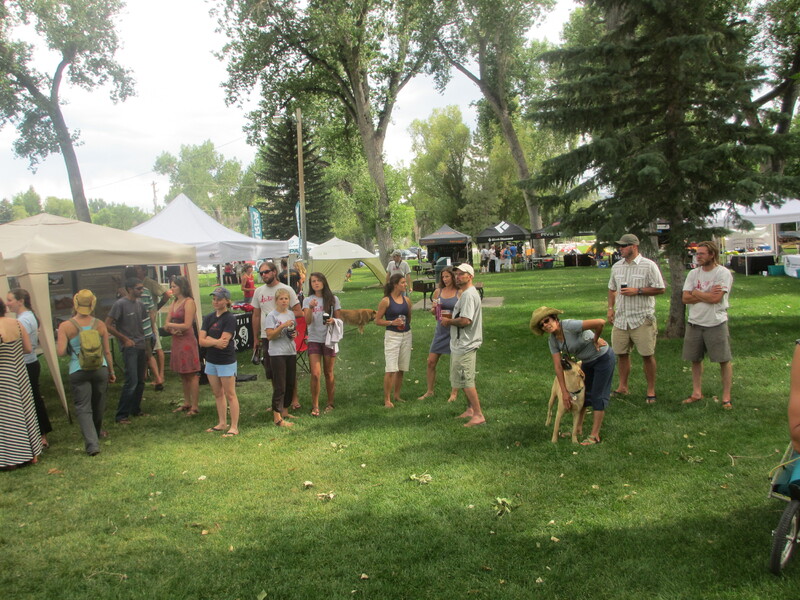 The route was the vision of Salt Lake hardman and fellow training advocate Jeff Pedersen. However, a young Dave Graham nabbed the first free ascent, and the name is reminiscent of the confessionary “I Am a Bad Man” (now known simply as Badman), so-named by JB Tribout after his friend Alan Watts told him, ‘you can have any route [at Smith Rock] except that one’. The Black and Tan Wall. Breakin’ the Law climbs out the subtle dihedral in the left side of the higher cave. The route begins with big moves up a steep wall to reach the roof of the cave. The crux is climbing out to the lip of the cave, then turning the lip to get established on the headwall. It would be quite a challenge for me to send a .14b in a week, but I’d heard from various accounts that the line was soft. However, just before we set out for Utah I talked with a prominent, much-stronger-than-me climber, who assured me the route was quite hard for shorter folks. Apparently tall climbers can get a big stem/dropknee that essentially eliminates the first, harder crux. So as we left Colorado I was apprehensive and anxious to find out for myself. 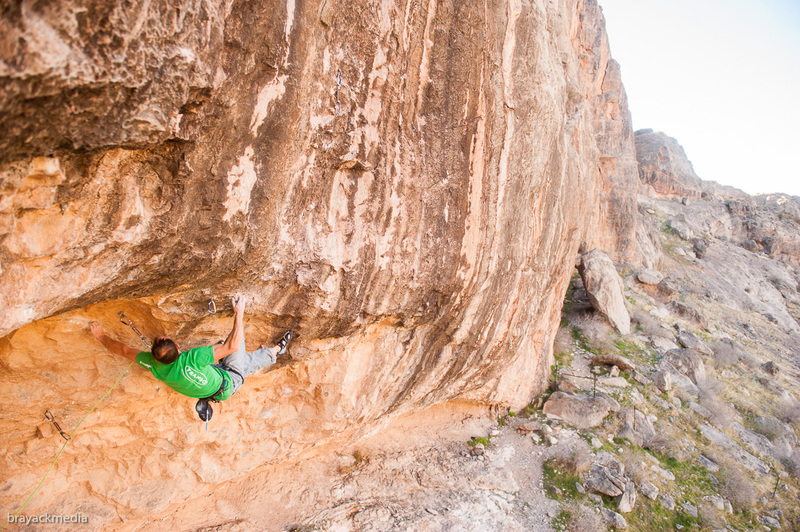 Breakin’ the Law: Midway through the first crux, a difficult traverse to the lip of the cave. Photo Dan Brayack. We planned to split up the long drive with a break in Grand Junction for lunch and a hike out to Independence Monument. I avoid aerobic exercise when I’m in performance climbing mode, but I like to go on “brisk walks” at least every rest day. It helps keep my metabolism humming (for the purpose of weight management), and it allows an opportunity to clear my head. The trail was snowy and muddy in places, but it was still a fun hike. I’ve climbed Otto’s Route at least three times that I can remember, and I suspect I’ll climb it again with Logan some time in the next decade. 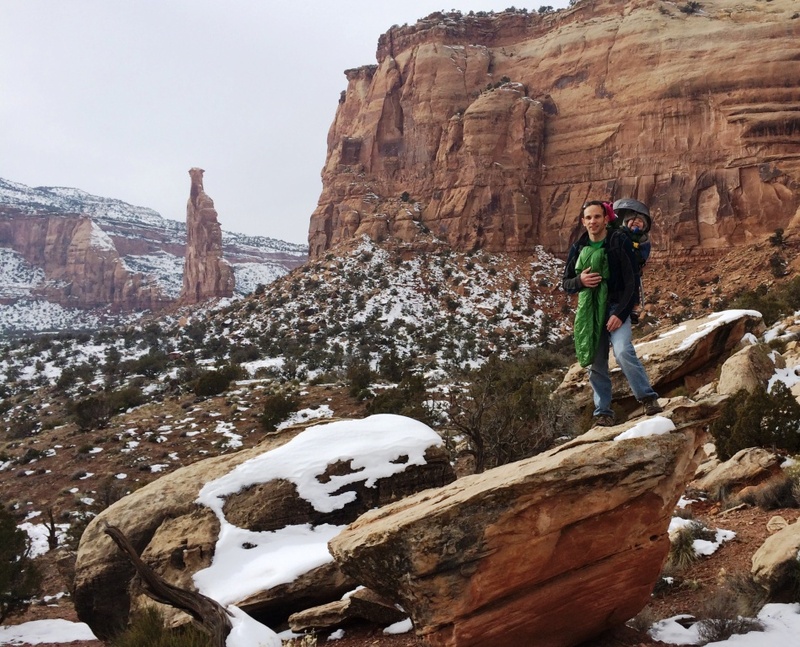 Logan and I on the hike to Independence Monument, outside Grand Junction, CO.
We spent the night in a flea-bag motel in fabulous Salina, Utah, then continued toward St. George the next day, making a beeline for Black & Tan. 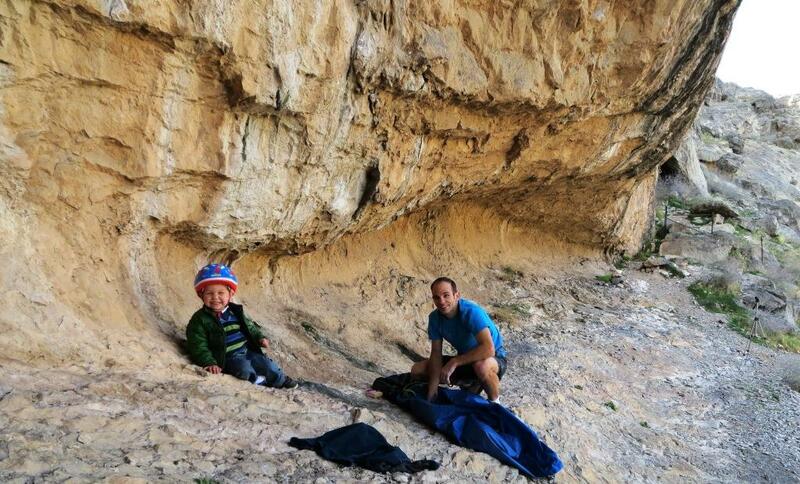 We met my friends Dan Brayack and Lena Moinova at the crag, who happened to be on vacation as well. Dan is a fellow Trango team-mate, and an outstanding climbing photographer. 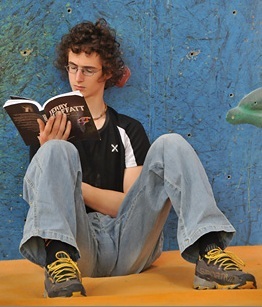 A hefty chunk of the photos in The Rock Climber’s Training Manual were generously provided by Dan. Some of Dan’s images are peppered throughout this post, or you can check out his amazing gallery here. After warming up , I got on my presumed project. The climbing starts out with fun, huge spans between large holds. There’s a big jug at the crook of the roof, then the first crux comes traversing from that jug to the lip of the cave. You can either shuffle or cross between several holds, but you end up with a good incut crimp and a tufa pinch. Depending on your sequence you can either dyno into a big iron cross, and then struggle to climb out of it, or you can make a wild lunge to a flat edge at the lip. I think this is where the drop knee would be used if you were tall enough, allowing either sequence to go statically. Since I was not able to use the dropknee, I tried the two alternatives and settled on the Iron Cross solution. Once at the lip, a really hard crank off a thin, sharp crimp gets you onto the slab. I struggled quite a bit with this move, perhaps because I was tired from working the lower crux. I figured this would end up being the redpoint crux but I was too exhausted to really work it. I moved on to the headwall, which was mostly fun, technical face climbing, but hosted one sinister move in which you have to high-step your right foot onto a polished block that slopes away at a 45-degree angle. There is a faint bit of patina on this block that allows you to toe-in a bit, which is key since you next have to reach for an over-head undercling, using this dire foothold to push against. Beginning the second crux, a heinous crank to gain the headwall. Photo Dan Brayack. At the end of the day I had all the moves worked out. Typically if I can do all the moves, I can send, but I had no idea if the moves would come together in the four climbing days remaining. The second crux requires a pretty hard crank after a long series of hard moves, and that is something I struggle with. 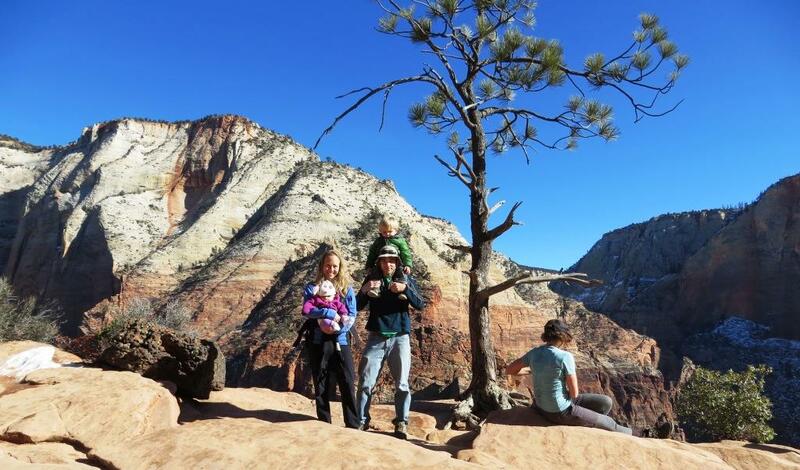 “Rest Day” hike to the West Rim of Zion Canyon. The limestone surrounding St. George is much more monolithic than the stone at most US limestone crags. That means it’s not very featured, and generally quite sharp. There are the odd pockets, but most of the climbing is on small edges. 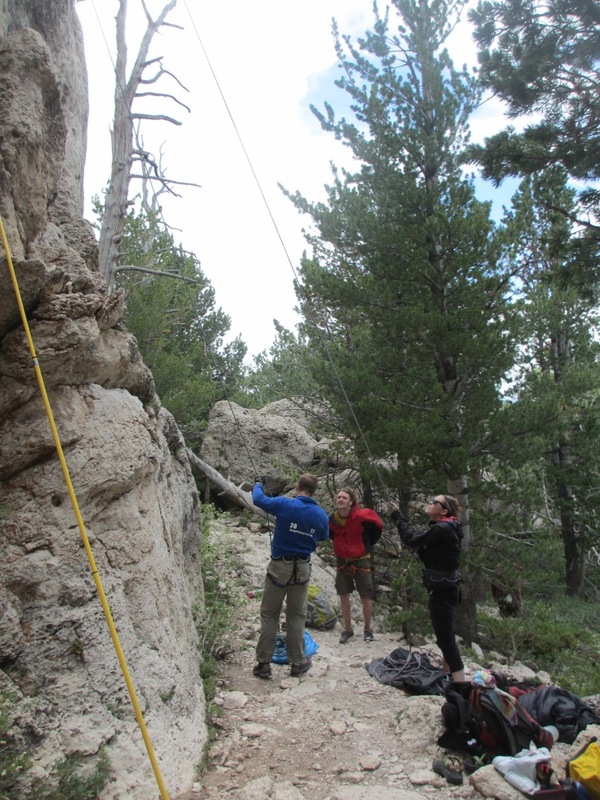 The result is that the climbing tends to be less steep at any given grade than you might encounter at other, more featured limestone crags like Rifle, or the Wyoming crags. 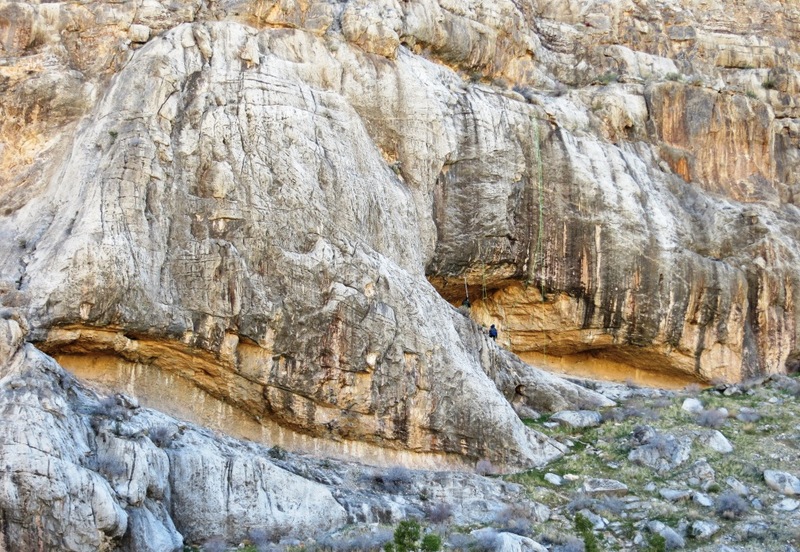 This is great for technicians like me, and these crags really shine in the 5.12+ and up range. Below that, the climbing often isn’t all that fun; it’s certainly not the type of climbing you want to do on vacation. Fortunately St George is all about variety, and there really is something for everyone. Jumanji is one of the better limestone 5.12a’s in the area. It’s a fine route, but its sharp, polished, and so not particularly fun by holiday standards. Photo Dan Brayack. Unwinding from the Iron Cross. Photo Dan Brayack. I made good progress on the second day, primarily refining my foot sequences, and rehearsing the big dyno into the Iron Cross at the lip. I was able to do the crank onto the headwall much more consistently, and on my second go I managed a 1-hang, which is always a nice milestone, but certainly no guarantee of future success. We celebrated New Year’s Eve by watching Logan’s Strawberry Shortcake DVD 4 or 5 times in a row and hitting the sack at 11pm. Spotting Logan while hiking near the Chuckwalla Wall on New Year’s Day. 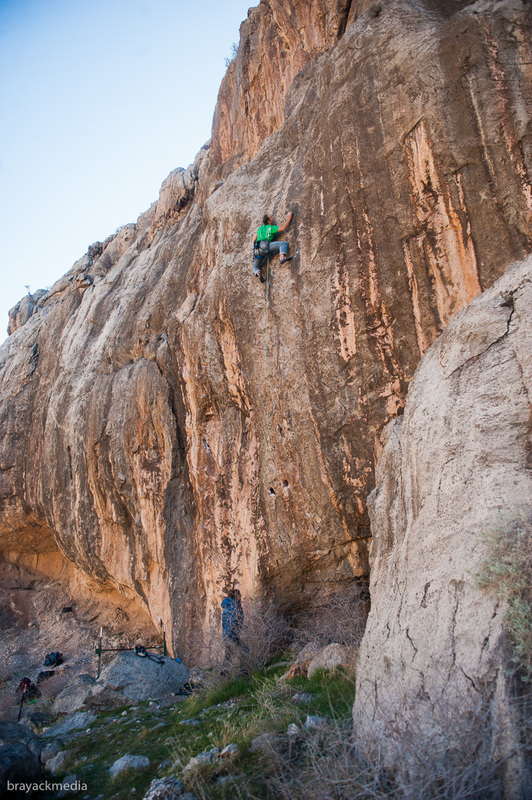 On our third climbing day we revisited Chuckwalla, then hightailed it to Black & Tan. My last warmup route felt really soft; either that or I was just feeling really strong. We got the kids situated (i.e., turned on the Ipad), rigged the rope, and I started up. Often I have a tendency to sprint on short power endurance climbs like this. 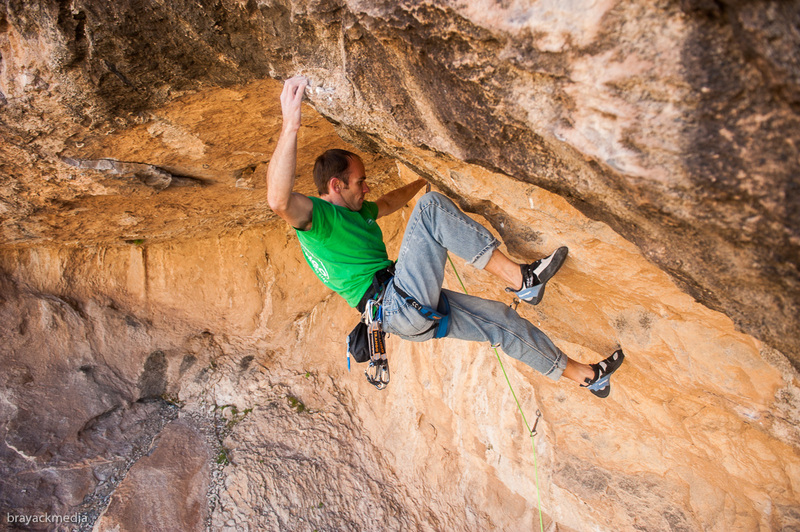 Each of the crux sections involve careful foot placements and subtle pressing to stay on the wall. Perhaps since I didn’t know the moves super well, I took my time and made sure I did every move correctly, following Alex Lowe’s adage to ‘never move up on a bad [ice tool] placement’. I expected to pump out at any moment, but I just kept motoring, going from one move to the next until I was on the headwall. After a nice long shake I hiked up the headwall to the chains. Logan and me at Black & Tan. The total effort took 5 burns over three days. I think the route is comparable in difficulty to Mission Overdrive in Clear Creek (which took me 6 goes over 3 days), which is to say its a hard 14a or easy 14b, without the stem/dropknee. I’m inclined to go with b 🙂 I’ve been crushing the campus board lately and I believe my power has reached a new level. Occasionally periodization doesn’t work out quite like you hope, but this time I think the timing of my fitness was perfect for the characteristics of Breakin’ the Law. 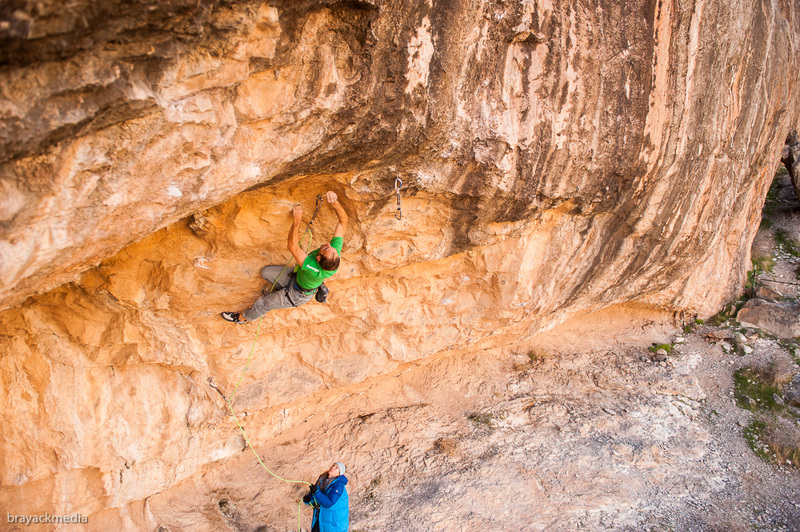 To celebrate, we headed to Kelly’s Rock (named for my old friend Kelly Oldrid) and climbed “K-8”, ‘one of the best 5.11s in Utah’, according to the guidebook. The climb includes two exciting roof pulls and some of the most amazing jugs I’ve ever seen. Certainly a worthy line and easily the best limestone 5.11 I climbed that week. Tune in next week for Sunny St. George Part II! 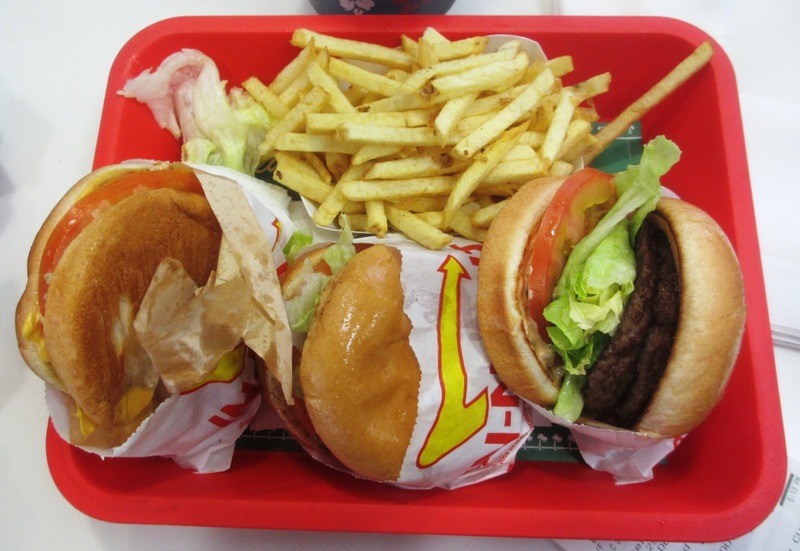 Celebratory Double Meat with Everything (hold the cheese), add whole grilled onion and chili peppers, from In N’ Out Burger. Definitely not on the diet plan but well worth it. 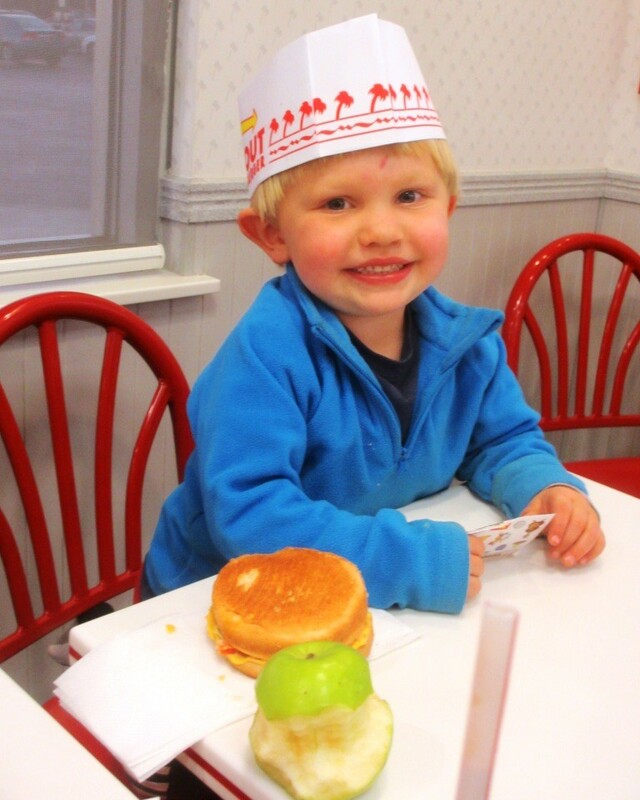 Logan stoked at In N’ Out. His new favorite food is Chocolate Milk Shakes. Tips for Effective Campusing Part 2: Going Big! 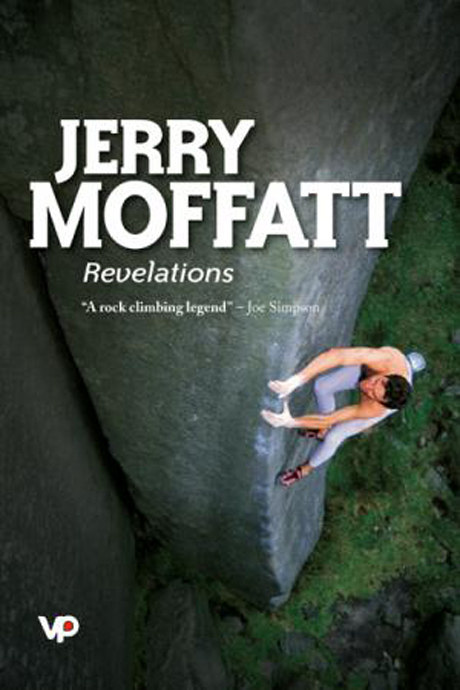 As implied here, I’m inspired by the climbing career of the legendary Jerry Moffatt. 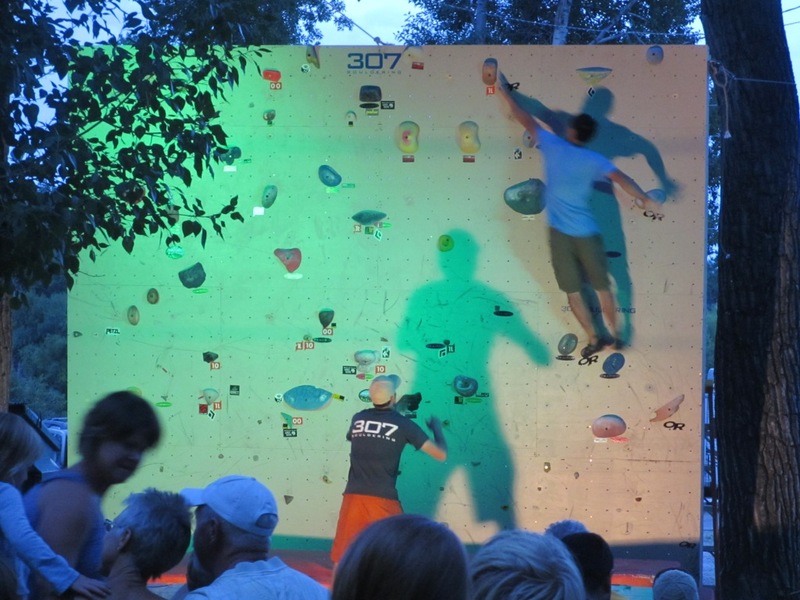 During his prime, Moffatt was the best climber in the world, and he dominated on redpoints, onsights, boulders and competitions. What inspires me most though, was his commitment to hard work and his dedication to training. He was a phenom in his early years, but that didn’t stop him from putting in long hours in training rooms, on the Bachar Ladder, and the campus board. He was near the top when 5.12+ was the world standard, and he managed to stay on the crest of the wave as the grades exploded all the way to 5.14c over the course of two decades. Moffatt notes in Revelations that his best effort on the Campus board was 1-5-8. Since I first read that, 1-5-8 has been in the back of my mind. That is something I might be able to do someday. Furthermore, although I haven’t been able to find anything definitive, I’m pretty sure Moffatt is at least a few inches taller than me. He looks to be within an inch or so of Ben Moon who is 5’11” (I’m 5’7″). Considering the obvious height dependence (or perhaps more precisely, arm-length dependence) of Max Ladders, I feel like it would be quite an accomplishment for me, to match Moffatt’s best. [Historical aside: Moffatt also says in Revelations he did 1-5-8 statically, which begs the question, if he could 1-5-8 statically, why didn’t he do anything harder than 1-5-8? Surely he could have. Examining pictures of the original Campus Board and the Schoolroom Board in Sheffield, it looks like they didn’t have half-steps, so 1-5-8.5 was off the table. Still, if Moffatt could do 1-5 statically, surely he could do 5-9 as well. Perhaps the original Campus Board didn’t reach that high. The below pics shows at least 9 rungs, and this video appears to show Gullich campusing up at least 9 rungs on the original board (watch from 0:40 to the end). Original Campus Board on the left, Schoolroom board on the right. Last year I did 1-8-15 on my Metolius-spaced board, which is pretty close to 1-4.25-7.5 in Moon Spacing. So I was somewhat close, but as soon as I switched to Moon Spacing I discovered that 1-5 is extremely difficult for me. I could do the move, but as soon as I latched rung 5, I felt a deep ache in my low shoulder. The pain didn’t feel threatening, just quite unpleasant, like the burn you feel in your muscles when you have a deep pump. It was impossible to sustain this position for more than an instant, let alone try to explode upwards from this position. This is where height dependence comes in to play on big campus moves. The distance between rung 1 and rung five is about 34.6 inches. The distance from my finger pads (when placed on an edge in a “half crimp” position) and the middle of my armpit is 27″. So even when locking my low hand all the way down to my armpit, I still have to eek another 7.5 inches of reach out of my body to span between 1 and 5, and I’ve discovered that to do so requires significant shoulder strength. Any excuse to post a pic with my shirt off 🙂 Here’s me spanning from Rung 1 to Rung 5. Note the difference in height between my two shoulders (about 3 half-increments, or 33cm/13 inches). I’ve found this requires a lot of strength in the low shoulder. I’ve tackled this weakness in two ways, and I would say each has contributed equally to my improvement. First, several years ago I added some shoulder strength exercises to my Strength Phase. For the 4-5 weeks preceding my Power Phase I will perform 3 sets of “Lateral-to-Front Raise” and “Shoulder Press” exercises after each hangboard workout (in addition to other exercises). This has helped prepare my shoulders for campus exercises, and for doing big/reachy moves in general. Furthermore, Explosive Pull-ups, Biceps Curls, and Hanging Leg Raises all strengthen muscle groups that are essential to limiting campus moves. The pull and upper arm muscles are obviously pivotal to generating upward movement, but are also key for slowing decent, making it easier to deadpoint each move. Not surprisingly, your abdominal muscles play a significant role, and you may notice your abs feel sore for a day or two following the first campus session of each season. It’s tremendously helpful to prepare these muscle groups prior to beginning your Power Phase, so you have good strength to build off of when you hit the campus board. Second, I started trying 1-5 regularly. About a year ago I started to introduce this move (or 1-10 on my old Metolius-spaced board) in my campus sessions (aka, “Max 1st Move”). At first I just tried to stick the move, then drop off. Eventually I start trying to match the high rung as my strength improved, or go to rung 5.5 or 6. 1) Get ridiculously strong, such that you can do a 1-arm pull-up from a small campus rung 🙂 However, as discussed last week that kinda defeats the purpose, and there are much easier ways to do it. 2) Use momentum. On the biggest moves, momentum becomes critical. It’s much easier to pull up if you keep your hips moving and never stop pulling upwards. Follow the methods described in Basic Tips, realizing their importance becomes magnified on bigger moves. Additionally, in the Basic Tips post I discussed aim and accuracy. I find it’s much more difficult to accurately place my fingers at the correct depth than it is to deadpoint to the proper vertical height. Failing to place your finger pads deep-enough on the rung can (and often does) ruin a set. If you don’t get deep enough, you will either fail to latch the rung, or need to bounce your hand into position before proceeding, thus killing any momentum. For this reason, I find it helps on difficult moves to aim “through the board”. Assume you are trying to latch a rung that is a quarter-pad deeper than your rung really is. This will often result in smacking your tips into the plywood, so don’t over-do it–try to aim for a 1/4″ or so deeper than you need. Your tips may get slightly bruised and sensitive, so go easy at first. With practice, you should be able to hit the correct depth on most moves without this technique, but on the most challenging sets, this can really help ensure you can keep your momentum flowing upward to the top. 3) Push with your low hand. This is critical, and probably the biggest difference between medium and large moves. For shorter folks in particular, once you are in the 1-5 position, your low hand will not be able to maintain a normal position for pulling for long (with your palm facing the board). Once you’ve pulled up off Rung 5 a few inches, your low forearm will be more horizontal than vertical, and your palm will be more or less facing the ground. Get in the habit of pushing down from this position (another reason I like the Shoulder Press is that it trains the Triceps for this motion). Push for as long as you can maintain contact with Rung 1, before stabbing upward for the high rung (Ben Moon exemplifies this at 6:55 here. His low hand pushes until his low elbow is nearly locked and his low arm is pointing straight down). This shows the action of my low hand while attempting 1-5-8 (Moon Spacing). The left frame shows the moment of latching Rung 5. The center frame is a point midway through the second move. The right frame shows the right hand’s last moment of contact with Rung 1. Note that my right arm is almost straight, and my hand is level with my thigh in the right frame. This will help with smaller moves as well, not just 1-5-9, but it takes practice. Dedicate a few sets each session to practicing this movement. Do the first move of your Max Ladder, but rather than focusing on latching the second move, focus on pushing with your low hand. Don’t even try to latch the high rung, just try to improve your ability to generate upward movement by pushing with your low hand. Once you start to get the hang of it, then try to focus on latching the high rung. Note that this will be easier to do on steeper boards and vice versa. If your campus board is less than 10-degrees overhanging or so it will be difficult to push properly. 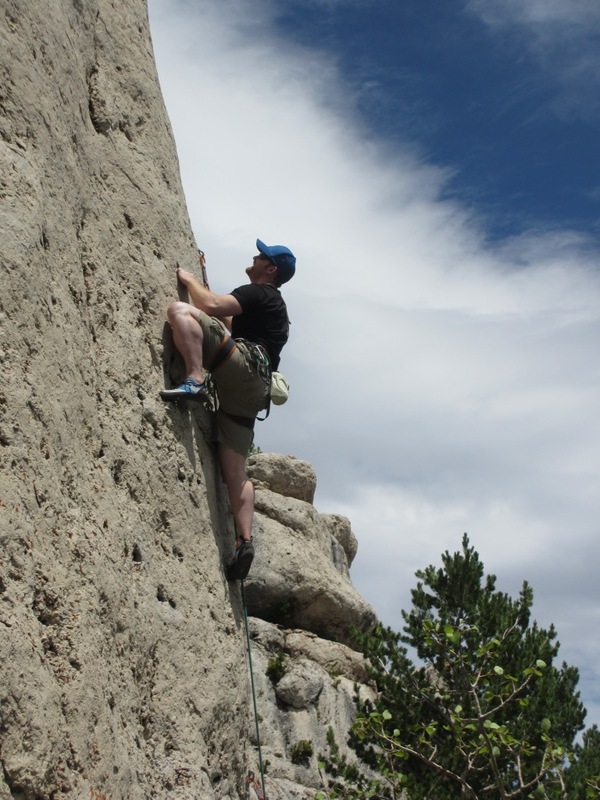 This is another aspect of campusing that translates directly to rock climbing (and something that even beginners can benefit from improving immediately). 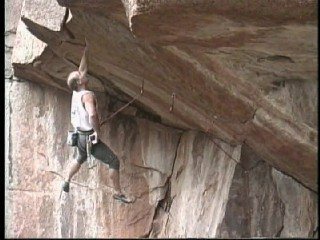 If you watch me climb, you will notice that I’m almost always pushing down with my low hand until the last possible moment, particularly on big moves. 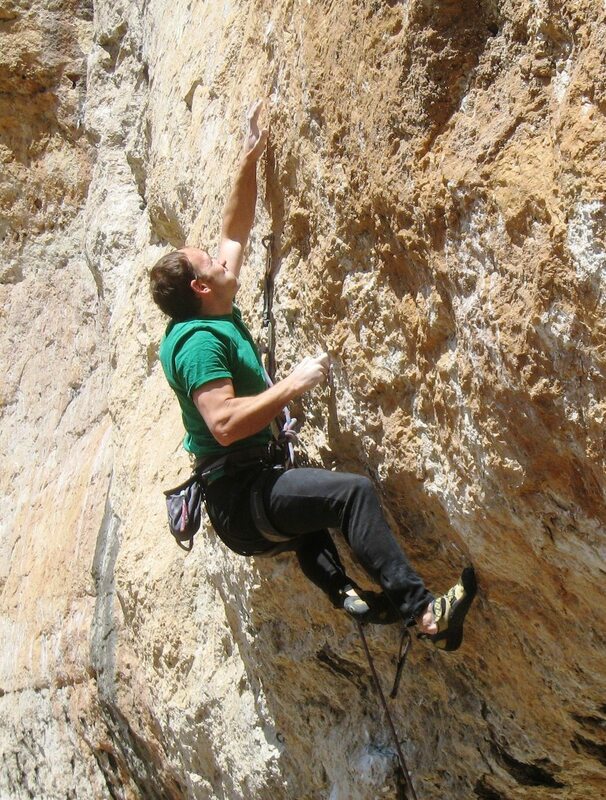 Many climbers ignore their low hand once the shoulder passes it. This is a mistake, and it puts unnecessary strain on the opposing arm’s fingers and pull muscles. Using the low hand to push on real rock. If you are trying to perform on the campus board (for whatever reason, such as to set a personal best), dropping to at, or near, your fighting weight will definitely help. As with any weight loss, don’t overdo it, lose weight intelligently, and incorporate it into your Seasonal Training Plan to ensure you can sustain it through your performance phase. For me, I struggle to stay at my fighting weight for more than about 4 weeks, so if I get to that weight in time for my Power Phase, I’m likely to struggle mid-way through my Performance Phase. Most climbers are concerned with their performance on the campus board, and so would be better off timing their diet to peak later in the season. Arousal – As with any power-oriented exercise, your mental state of arousal can play a big part. In other types of climbing, excessive arousal can be a hindrance (like a technical route where precise footwork is required). There is certainly a technical aspect to campusing, as discussed at length. It’s important to work on the technique, but it’s also important to just go for it at times and see what you can do. If you are stilling learning the technique, spend the first half of the workout going slow, working on individual aspects of your Max Ladder, and using your conscious mind to control your actions. Then get aggro for the rest of the workout. This is the time to get fired up and go for it. Don’t worry about doing the movements perfectly; focus on giving each attempt your most intense effort. Different people have their own triggers, so experiment with different methods and see what works best for you. I like to listen to upbeat music, usually Hip Hop or something with a strong beat. Occasionally I’ll grit my teeth and make a “GRRR!” sound just before I start a set. 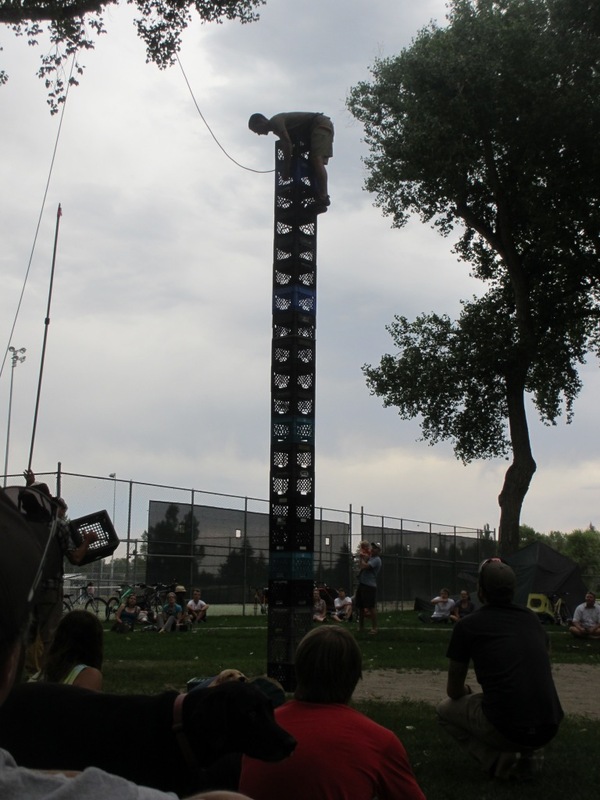 I’m not much of a screamer, but I will occasionally let out a brief ‘yelp’ as I begin the second move of a Max Ladder. Some folks have tried external stimulants like caffeine (and who knows what else in the ’80s), but I generally avoid that kind of thing. Record Keeping – One could argue you aren’t training if you aren’t keeping track. I went many years without documenting my campus work, and it was a huge mistake. I had no idea what my plan was, or any way of telling if I was getting better. As soon as I started documenting my workouts I started making significant progress. 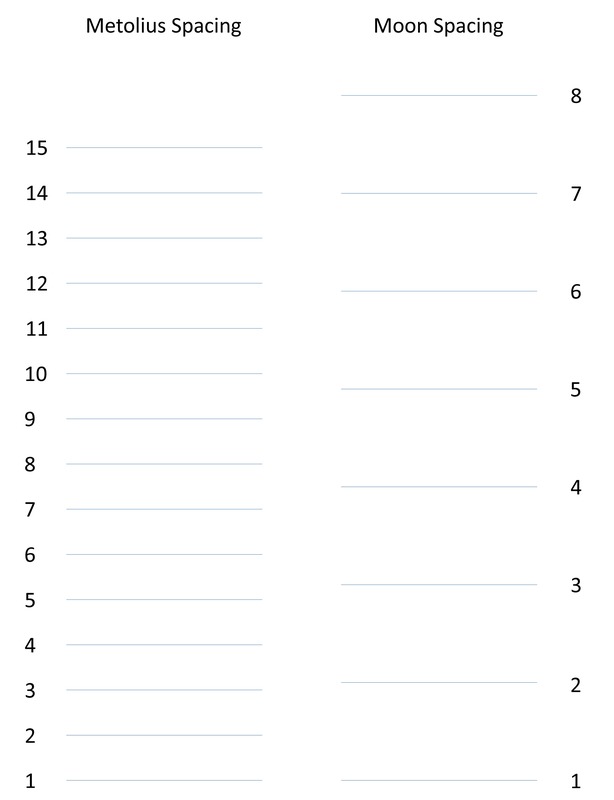 Use a log sheet like the one shown here to document each set of your workouts. Make not of your personal bests, and strive to match, and then surpass them, each season. Also, use the log to desribe your campus board’s specifications in case you ever change venues. Perhaps 1-5-9 isn’t out of the question for me after all? Last year I discussed at length the benefits of Campus Training, how to perform a Campus workout, and how to fit such workouts into your training schedule. Next week I plan to describe how to get the most out of your campus sessions. Campusing “well”, will reduce the risk of injury, improve your performance on the campus board so you can show up your friends :), and most importantly, ensure that your workouts translate effectively to actual rock climbing. As a prologue to next week’s discussion, I’d like to describe some of the modifications I’ve made to the Lazy H Campus Board over the last year, and the reasons for making those changes. First off, you may recall that last January I “topped out” on Version 3.0 of my board, so the most pressing task was to make my board taller. The Lazy H was originally built along the contour of the sloping hillside, so it’s not “square”; the west, uphill side of the ceiling is a couple feet higher in elevation than the east, downhill side. So this means the west edge of my campus board (right edge when facing the board) is about 4.5″ taller than the east edge (since the bottom edge of the board is horizontal). So the easiest way to gain more height was to move my smallest rungs from the center of the board to the far right side. This earned me an extra 1″ of height. Next, I decided I would lower the bottom edge (and therefore the first row of rungs) approximately 2.75″ to eek out a bit more height. The tradeoff here is a lower clearance height when walking under the board, and I have to start campus moves from a slightly lower position, which can be annoying. These two changes only got me about one extra rung (with 4″ ‘Metolius’ spacing), which I’m hoping will not be enough. So I decided to cut out a hole in my ceiling between two roof joists to accomodate another rung. The distance between joists was only about 15″, so I had to trim the top rung to fit. Not the prettiest solution, but better than nothing. My ghetto ceiling cutout and slightly shortened rung. I haven’t actually tried campusing to this rung yet. I suspect it will punish poor accuracy. Additionally, over the past year or so I’ve been contemplating the two competing standards for rung spacing. These are ‘Metolius spacing’, with small rungs placed every 4″ from top edge to top edge, and ‘Moon Spacing’, with rungs spaced every 22-cm (approximately 8.66 inches). In my estimation, Moon spacing is far more prolific. Metolius spacing is only used in America as far as I can tell, and even here it’s much less popular than Moon spacing. For the last few seasons I found myself constantly “translating” my Metolius-spaced board into Moon units for the sake of comparison. I got tired of my head hurting during all these workouts, so I decided to make the switch since I was re-building my board anyway. The expression “1-5-9” is based on Moon spacing. I’m highly motivated to strive for these feats and compare my campus performance to other people’s around the globe. I think 1-5-9 may be beyond my reach, but I would be very psyched to match Jerry Moffatt’s best of 1-5-8, which I think is within the realm of possibility for me. In many other sports (such as running, swimming, cycling, and weightlifting), training activities and performances are easily quantified and compared. 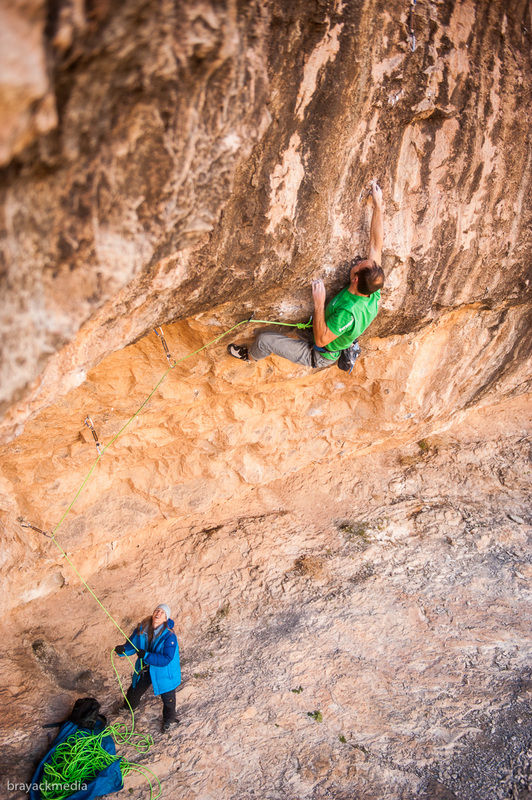 Making comparisons in climbing is very difficult, except when two climbers have climbed the same exact route (which is not very common, compared to the likelihood of two runners sprinting around two separate tracks built to the same specifications). Just about any runner in the world can find a 400m track to train on, allowing easy comparison with any other runner in the world. 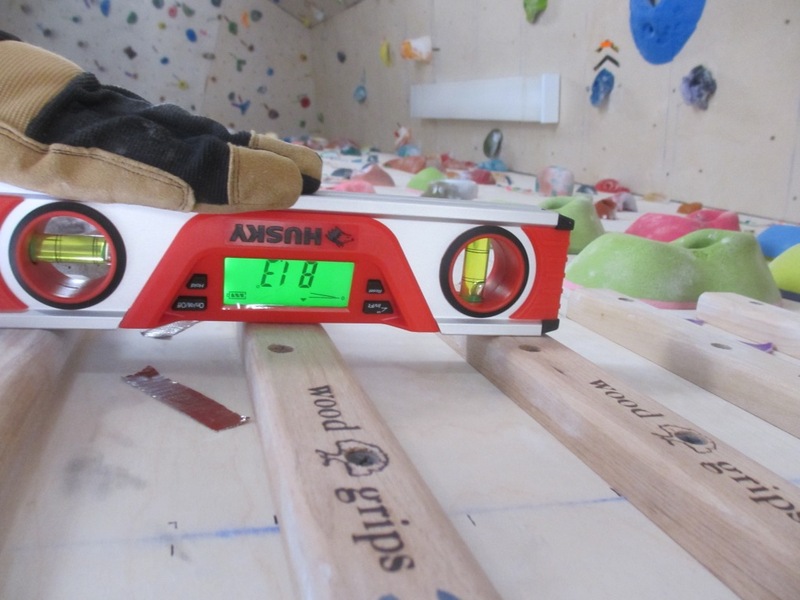 Campus training is just about the only more-or-less-standardized activity that climbers perform*, so it provides a significant opportunity for quantification and comparison, assuming common standards are used. It’s amazing to me that I can build a campus board to the same dimensions as Jerry Moffatt’s or Wolfgang Gullich’s** and try to match feats they performed nearly 30 years ago. Even on the rock–which seems to be relatively unchanging–holds break, footholds become polished, and the proliferation of chalk, rubber marks and video reduce the challenge over time, making comparisons in-exact. If you can ignore these variations, you still may have to travel accross oceans for the chance to try your hero’s test-piece, and then you will have a brief moment in time to give it your best shot. Anyone can build a standardized campus board in their own house, and train on it year after year. [*The Moon Board is a brilliant concept that provides the possibility for worldwide comparison, but the idea hasn’t really caught on, and so Moon Boards are few and far between. The Moon spacing standard is probably the best choice since its the most prolific, however, as discussed here, 22-cm is way too far between rungs to facilitate steady progression. The solution is to add half-steps, such that rungs are spaced evenly at 11-cm intervals. This equates to about 4.33″, which is just a smidgen further than the 4″ Metolius gap. Close enough to facilitate progression while still allowing quick worldwide comparison. The final result was a board that goes from 1 to 8.5, with half-steps between each rung. If I ever send 1-5-8.5, I’ll add a “rung 0.5” to the bottom of my board to work 1-5-9. Lazy H Campus Board Version 4.0. Small rungs, incut side up, on the right, spaced at 11 cm. Medium rungs, flat-side-up on the left, spaced at 22-cm. Three small rungs, flat side up, laid over the medium rungs (at positions 1.5, 4.5 and 7.5). Finally, Ben asked here if there was a reason I had oriented my small rungs with the “incut” side up. Ever since then I’ve been wondering what the difference in apparent difficulty is between the two orientations. On the surface, it would seem obvious that incut rungs would be easier to use. However, the incut edge (of a small Metolius rung) includes a relatively massive 5/16″ edge radius, while the flat edge has a relatively small 3/16″ radius. The effect is that while the flat side is less positive, it provides a deeper surface for pulling (9/16″ depth of flat surface compared to 1/16″ depth of essentially flat surface plus 3/8″ depth of positive surface on the incut side). 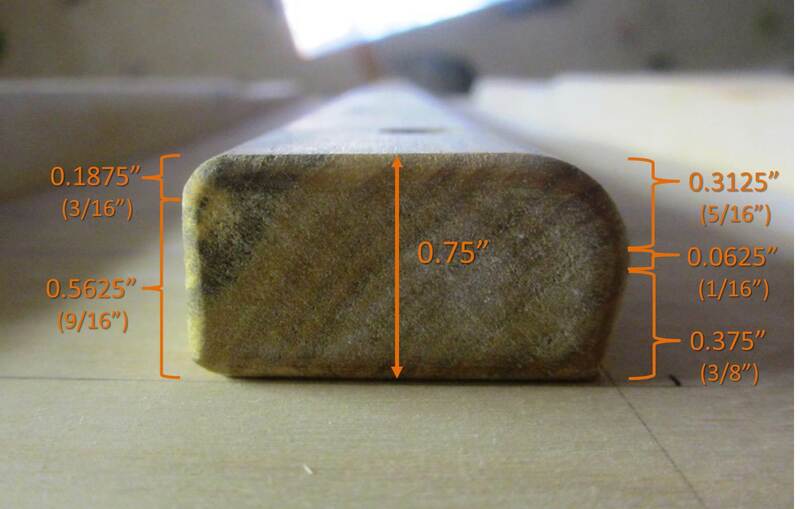 Approximate dimensions of a small Metolius campus rung, based on my measurements. The ‘flat’ side is on the left, the ‘incut’ side is on the right. Of note, these rungs are supposedly 3/4″ deep, but I found them to be a bit less than that. 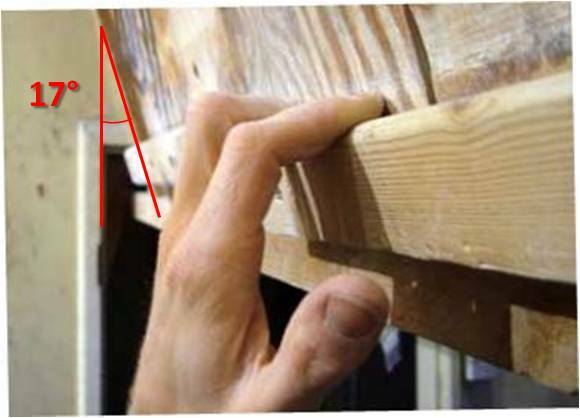 Deeper holds are easier to use because the point at which force is applied to your finger pad is nearer to your DIP/PIP joints, reducing the leverage (or “moment”) on those joints. Theoretically one could measure the coefficient of friction of these rungs and attempt to calcuate the torque required to hang on them (statically) in each orientation , but such calculations would almost certainly need to neglect all the critical dynamic aspects of a campus move. The most practical way I could think of to determine the apparent difference between these orientations was to mount a set of each side-by-side and try them out. Comparing the flat & incut edges side-by-side, you can hardly notice the “incut”. Just from appearances, the Flat-Side-Up edge looks easier to grab to me. Flat-Side-Up feels noticeably “sharper” (un-skin-friendly). I could easily see getting a flapper using the relatively small-radius flat side. Long moves to distant rungs are easier to latch on Flat-Side-Up rungs. I think this is because when latching a distant rung, the arm is oriented near-vertical, so the ‘slopey’ nature of the gripping surface is not much of a factor, while the extra depth, and sharper lip make the rung easier to latch. When attempting long moves, its more difficult to keep the low hand in-play on Flat-Side-Up rungs. I think this is because with larger moves you really need to push down with your lagging hand (more on this next week), while that forearm is nearly horizontal to the ground. An incut edge allows you to pull out slightly, which really helps keep that hand in contact with the rung until you’re ready to remove it. I think with practice I would get better at pushing the low hand in the “right” direction (parallel to the angle of the board) and this would be less problematic. Overall, for smaller moves, the flat-side-up configuration was noticeably easier for me. This held true up to a 1-4-7 Max Ladder. Overall, for moves at my limit, the two orientations seemed equal in difficulty. When I tried 1-4.5-7.5 or 1-4.5-8 on Flat-Side-Up rungs, I noticed my lagging hand occasionally slipped off Rung 1 (and even Rung 4.5) when I tried to push off (to go from 1 to 7.5 or 8), which made up for the relative ease of latching distant rungs. In conclusion, I plan to stick with Incut-Side-Up rungs (pun intended). The difficulty seems about the same, but the smooth radius on the incut side of the rung makes them much less threatening to my skin. The last thing I need is a skin injury from campusing. Next week, I will get into the details of how to campus effectively. Campusing is perhaps the most difficult training activity to do well. If not done properly, campusing is a waste of time, but even worse, it can cause serious injury. Proper form will help you minimize the risk of injury while ensuring you get the most value out of this training. Campus Board Refurbishment- What’s Your Angle? When I built my gym in the Lazy H, I never really put much thought into the angles of the walls. I mocked it up with the joists and basically just eye-balled it. Almost immediately it became clear that my campus board wasn’t quite as steep as it should be, and this has been an itch in the back of my mind for a long time. During my fall campus phase I started doing some research on the “standard” angle for a campus board. This research revealed that there is no standard, although one could make a really strong argument for 15 degrees overhanging, as a compromise if nothing else. This is what Metolious advocates in their brochure, and some sources indicate this is the angle of the Schoolroom Board in Sheffield (although others say 12.5), a board that many others are modeled after. Looking at photos of Gullich on the original Campus board, it appears that was around 11 degrees, so one might make an argument for that angle as well. It appears to me that the board on Moon Climbing is about 17 degrees. 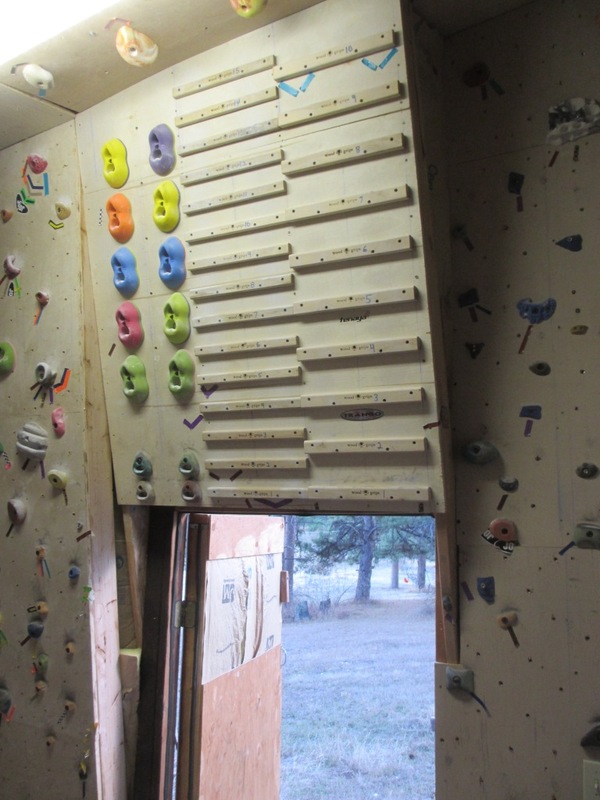 Some other sources advocate for 20 degrees (which happens to be the angle of the Foundry board; Jerry Moffatt’s climbing gym). The angle of the board can be important for several reasons. First, it affects how incut the rungs feel. Obviously the rungs will feel less positive on a steeper board, and should be slightly harder to grip. But they should also be less painful to latch. Second, a steeper board will keep your hips and lower legs further from the board. In addition to keeping you from kicking the board as you get higher, this gives more room for the low hand to continue pushing down when you make really big moves (moves in which your low hand is below shoulder height). Finally, the steeper the board, the less vertical distance one must travel to move from rung to rung. My board was installed at the same angle as the south side wall, about 8 degrees overhanging. 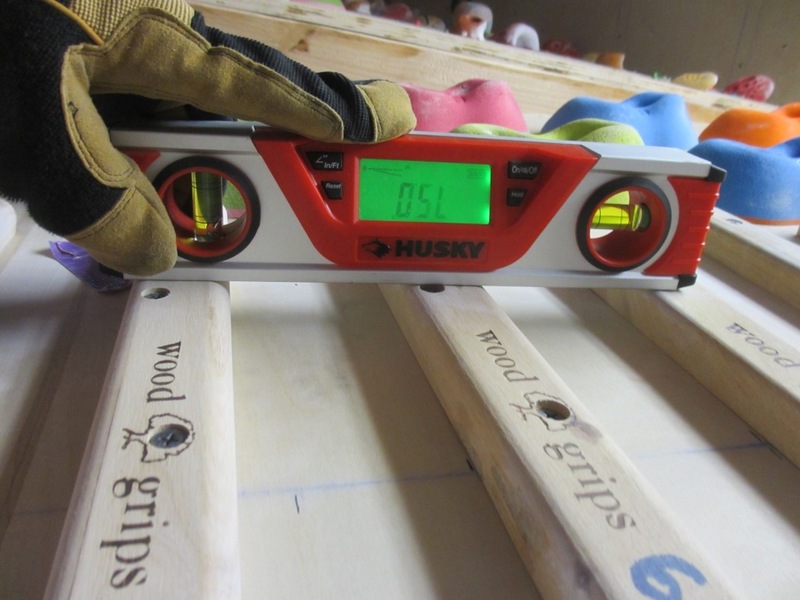 At that angle, a move between two rungs spaced 12″ apart requires 11.88″ of vertical travel. At 15 degrees, the same move requires 11.59″ of vertical travel. Probably not a big deal, but consider the mythical 1-5-9 Max Ladder (Moon spacing, 22cm between rungs). The lagging hand must travel 176 centimeters (almost 4 cubits!) across the board when going from 1 to 9. For such a big move the difference in vertical travel between an 8 degree and 15 degree board is 1 and 11/16 inches (a little over 4 and a quarter centimeters for those keeping track). That is the sort of thing that goes through my head when I’m sitting in staff meetings, and that is what is slowly making me insane. But I digress. I wanted to know how perceptible such a difference would be, and what impact it might have on my campus performance. Is it all a wash, with the improved incut of a less-steep board compensating for the greater span? Or would I suddenly burst through and set new personal bests on a slightly steeper board (heaven forbid I actually get worse). I resolved to correct the error of my original construction, but to do so would required tearing up half the gym, so I had to wait for the off season. Removing the interior panels to access the lower joist joints. The board is mounted primarily to two 2×6 joists that connect to the main structure of the barn at the floor and ceiling. 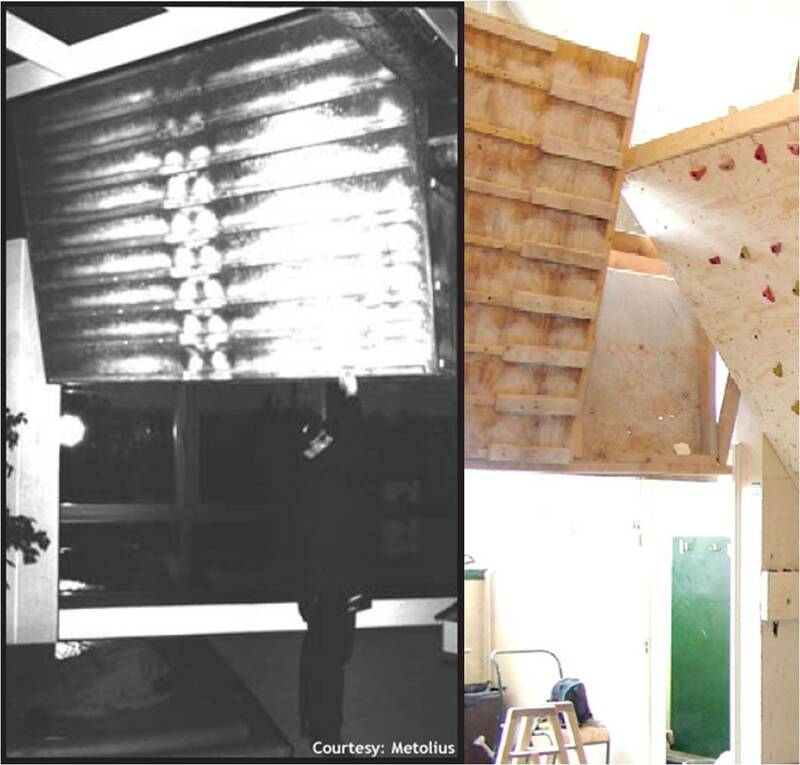 The plan was to install a temporary hinge of sorts to the cieling joint, then disconnect the floor joint and “swing” the entire campus board structure up to the desired 15 degree angle. Easier said than done. The top of the board was relatively easy to get to, as I never finished installing the interior panel on the east side of the board. 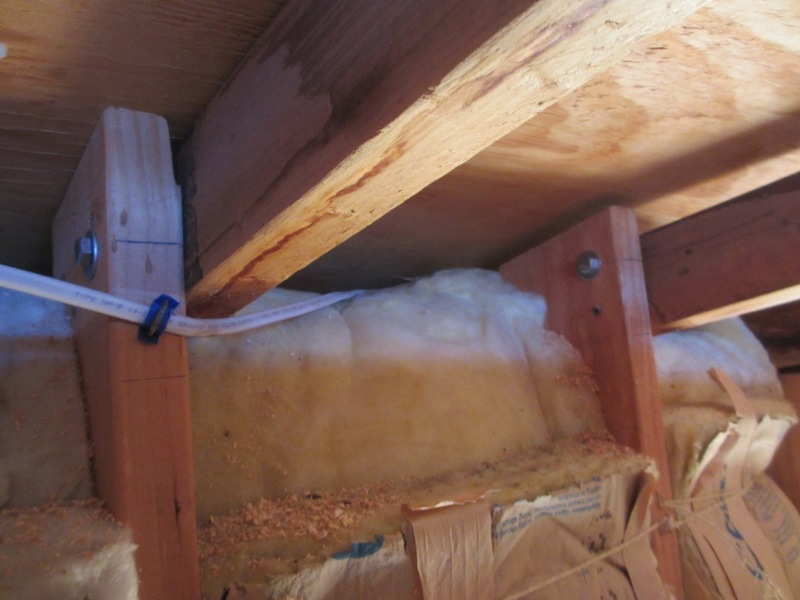 I started by installing 3/8″ bolts in the joists and adjoining rafters at the top of the board to create the “hinge”. The next step was to remove a seemingly endless series of interior panels to get access to the lower joist joints. Apparently the entire interior is one long daisy chain, where Panel A can’t be removed without removing Panel B, Panel B can’t be removed without removing Panel C, and so on. In the end I had to remove 10 interior panels, two exterior panels and miscellaneous trim pieces. Each Panel averaged around 16 screws, not counting screw-on jibs which I thoughtfully installed right on the studs (meaning they had to be removed to free the panels). “Hinge” Bolts installed at the top end of the joists. Campus Board Angle After: I’m sure it was totally worth it! Campus board installed at the new and improved angle. This is Part 1 of a 3 part mini-series on Campus Training. Check back for the rest of the story in the near future. Gullich going big on the original Campus Board. Note how low his left hand is! The legend of the original Campus Board is well-known and often re-told, not unlike the Epic tales of the ancient Greeks. The incomparable Wolfgang Gullich installed the first board at a Nurnberg gym known as “The Campus Centre” to help elevate his finger strength to levels that could only be described as “futuristic”. 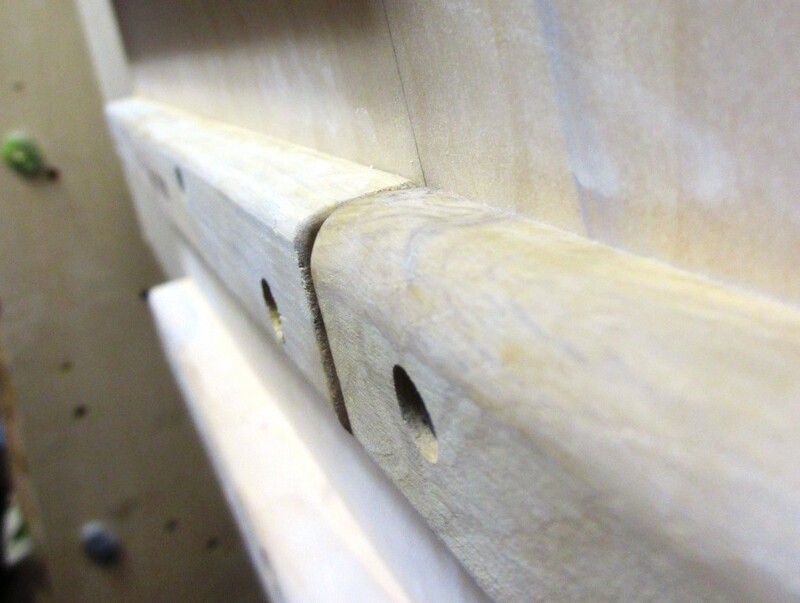 The board consists of a ladder of finger edges, and the training method is to move dynamically between these edges with feet dangling. 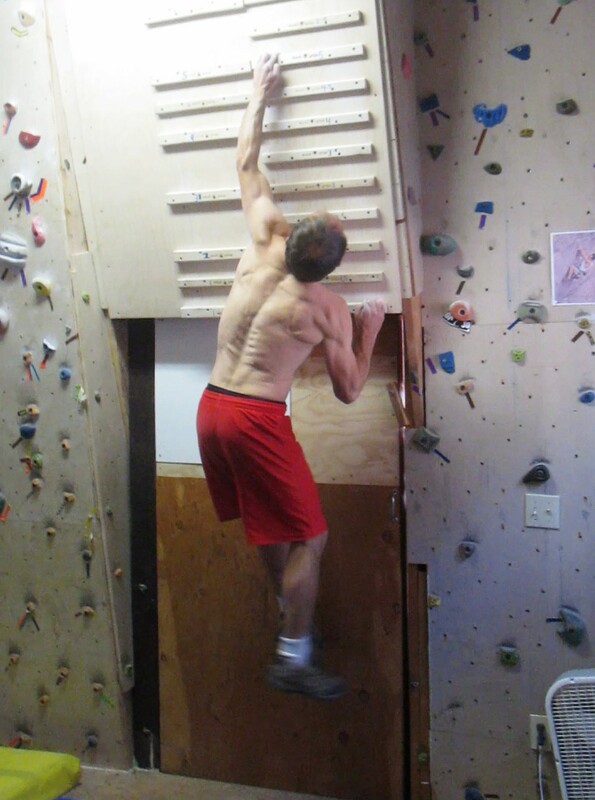 The concept behind the Campus Board is to apply methods of “Plyometric Training” in a manner that is specific to rock climbers. Plyometrics have been around for a while, originally developed by Soviet Track & Field coaches in the 1960s to help train explosive power in their athletes. Early plyometrics involved activities like jumping off a high surface, landing on a lower surface and immediately springing back up to the original height. Theoretically the landing causes an involuntary eccentric contraction in the leg muscles which must be immediately converted to a concentric contraction in a very short period of time. This type of training is still widely regarded as the best method for improving explosive power. 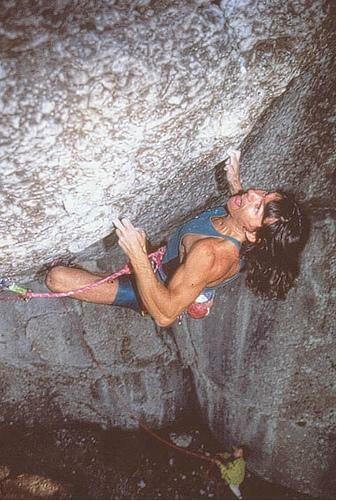 Gullich’s visionary adaptation of these concepts proved to be the key to his ground-breaking ascent of Action Directe in 1991, amazingly still one of the hardest routes in the world. Considering that (simplistically speaking) Power equals Force divided by Time, there are two key reasons Plyometric Training is effective at developing explosive power. While it helps increase muscle fiber recruitment (key to maximizing the force element of the equation), there are many ways to increase recruitment some of which are likely more effective. What sets plyometrics apart is the dynamic aspect of the training, which helps train muscle fibers to contract more quickly, allowing us to generate high levels of force in short order. The obvious application to climbers is to use plyometrics to improve “contact strength” (if you’re unclear on the definition, read this), the key to performing difficult dynamic climbing moves (and often the key to success on hard routes or boulder problems). As with classic Plyometric training, the act of latching a difficult dynamic move entails a short period of eccentric contraction in the forearm muscles followed by an immediate concentric contraction to achieve the desired isometric grip position. In addition to the pure strength benefits of Campus Training, this method is very helpful for improving the inter-muscular coordination required for good “accuracy” in dynamic movements. The more you practice dynoing or campusing, the better your brain gets at aiming for holds. In a few sessions I can pretty quickly get to a point where I’m basically deadpointing every campus move, which makes the moves much easier. This accuracy translates directly to the rock, although on rock, every move is different, so your accuracy on an onsight will likely never be perfect, but it should improve over time. The more you practice dynamic movements, the better your body & mind get at remembering those types of movements, meaning you should find yourself better able to “dial” dynamic moves on your projects over time. 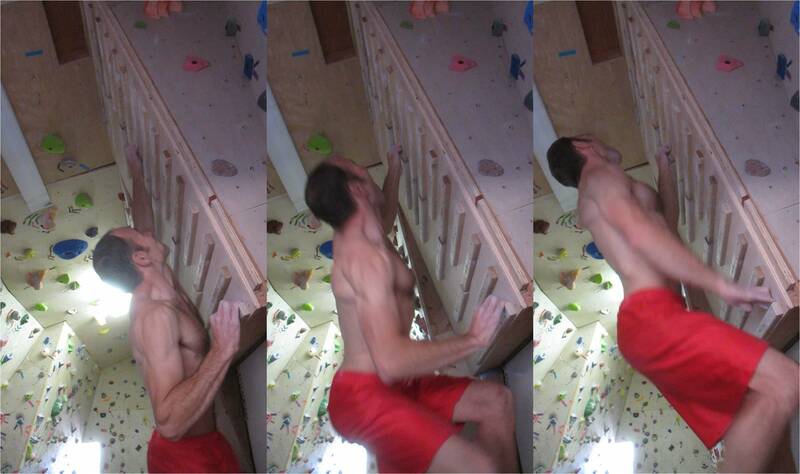 Finally, its well known that some climbers just don’t do well on dynamic moves. This could be due to a general lack of aggression or a strong desire to remain “in control” on the rock. Campusing can work wonders with these issues. 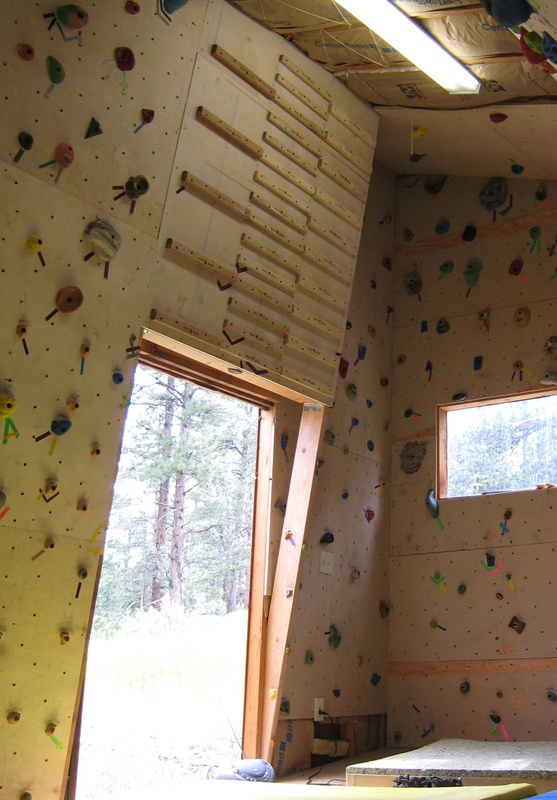 By encouraging aggressive and committing movement in a low-risk environment, climbers can overcome years of overly static movement after only a handful of short campus sessions. 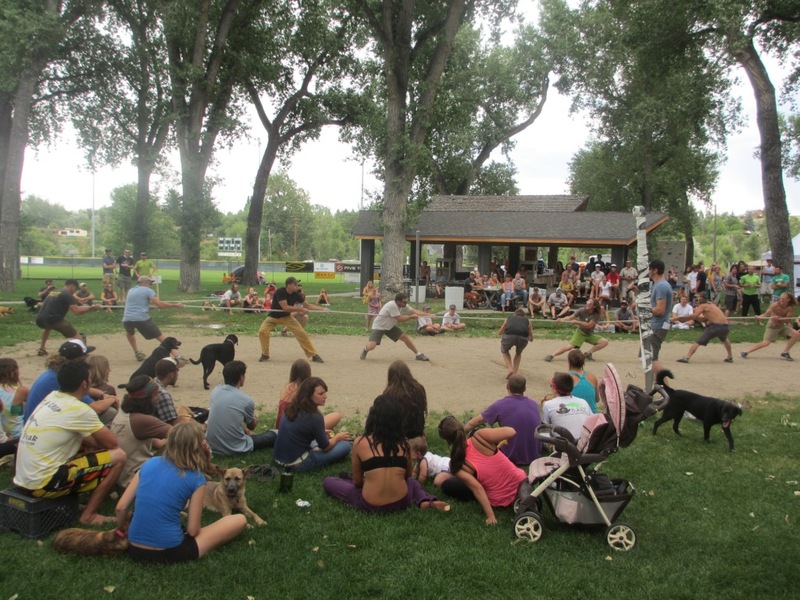 With all the many great things Campusing has to offer, its worth noting the downsides. First, there is no doubt that campusing is much harder on the joints than other methods of recruitment training such as hangboarding. Campusing is by its very nature somewhat wild and out of control. With a hangboard you can dial-down the intensity at will, and let go the moment things get uncomfortable. Often in campusing (or dynoing in general) the only sign of injury comes after its too late. For that reason, its critical to minimize the amount of time dedicated to the Campus Board, and ensure that you are 100% injury free before beginning any campus activities. Elbows are particularly at risk, but shoulders and fingers need to be healthy as well. Hopefully your board looks something like this, or perhaps even better. From left to right the board has “Large”, “Small” and “Medium” rungs. Now that you’re all psyched to get campusing, you just need get yourself a Campus Board. Ideally you have a local gym with an acceptable board. 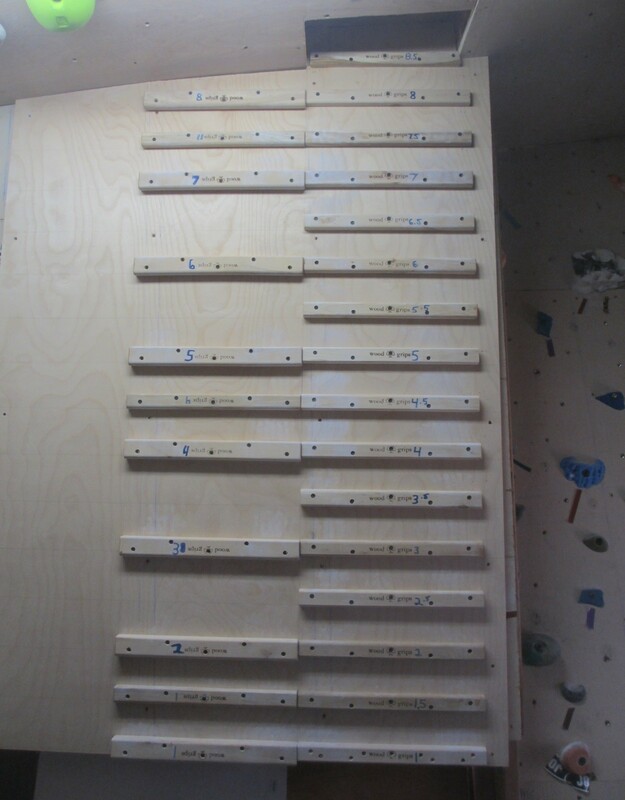 The board needs to be in good shape, with a large quantity of smooth “rungs” of uniform size and shape, spaced at short intervals (around 3-4″). Many boards have way too few rungs. The result is climbers quickly progress to whatever is near their limit, then its pretty much impossible to improve any further because the next increment of progression is too great. The legendary Ben Moon has popularized the spacing of his board (22cm intervals), which is famous for the “1-5-9” ladder. This spacing is way too big! Someone like me can do 1-4-7 on Moon spacing, but I would have no prayer of doing 1-5-9. So I would be forced to do something that is too easy to be at my limit. Some day I may be able to do 1-5-9, but I won’t get there by repeatedly doing 1-4-7. Another common problem is boards that mix different sizes and shapes of rungs on the same ladder. This causes the same problem as a board with too few rungs. 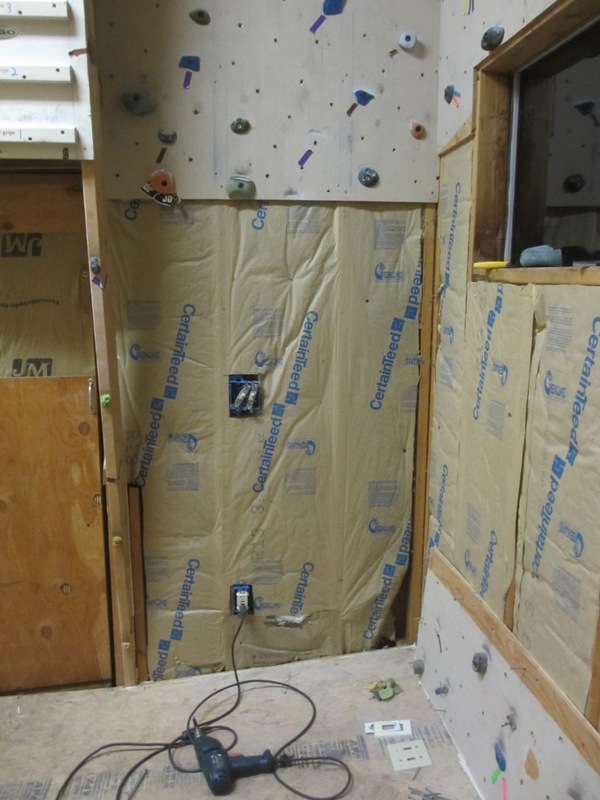 The board should be ~15 degrees overhanging, and free-hanging to allow your feet and legs to swing around without dabbing on nearby walls. If you don’t have access to a good campus board and you want to build your own, I highly recommend wooden Campus Rungs like these. For some great tips on building your board, check out this guide. You don’t necessarily need all three sizes of rungs–at this point I have no use for the Large rungs and only use the Medium rungs for warming up. 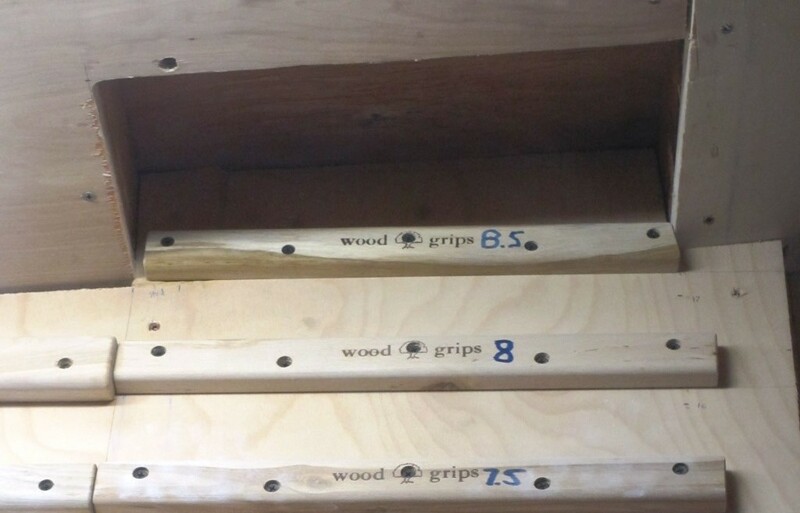 Finally, the rungs need to be numbered so that you can record and track your training. Look for much more on how to get the most out of the Campus Board in the next few weeks….